The PULSES Profile was developed from the Canadian Army’s 1943 “Physical Standards and Instructions” for the medical examination of army recruits and soldiers, known as the PULHEMS Profile. In 1979, Granger proposed a revised version of the PULSES Profile with slight modifications to the classification levels and an expanded scope for three categories. This is now considered the standard version. 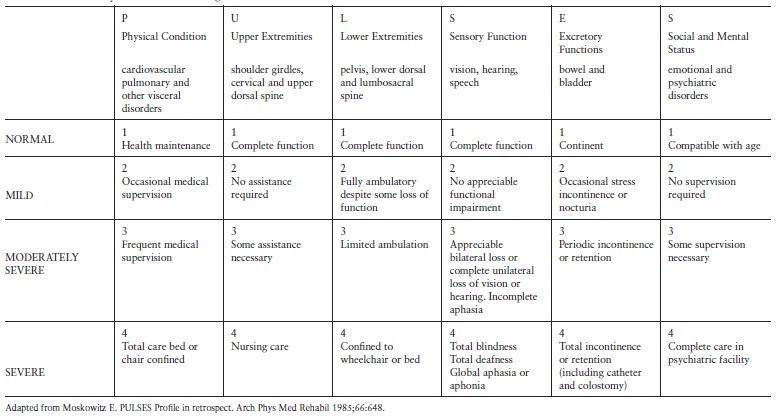 Four levels of impairment were originally specified for each component and the six scores were presented separately, as a profile. For the revised version, Granger et al. reported a test-retest reliability of 0.87 and an inter-rater reliability exceeding 0.95, comparable with their results for the Barthel Index (5, p150). In a sample of 197 stroke patients, coefficient alpha was 0.74 at admission and 0.78 at discharge (7, p762). In the study of 197 stroke patients, the PULSES Profile at admission and discharge correlated −0.82 and −0.88 with the Functional Independence Measure (FIM); the areas under the receiver operating characteristic curve were virtually identical for both instruments in predicting discharge to the community versus long term care. In a logistic regression prediction of discharge destination, the FIM accounted for no further variance once the PULSES had been included in the analysis (7, p763). In the same study, a multitrait-multimethod analysis supported the construct validity of the PULSES. ↑ Moskowitz E. PULSES Profile in retrospect. Arch Phys Med Rehabil 1985;66:647–648. ↑ Granger CV, Sherwood CC, Greer DS. Functional status measures in a comprehensive stroke care program. Arch Phys Med Rehabil 1977;58:555–561.